Charge your Apple devices quickly and conveniently with this car charging and Lightning to USB cable kit. The bundle includes a car charger, as well as a complimentary Lightning to USB cable. What great value and an excellent product. Thanks you mobile fun for providing such an excellent service. 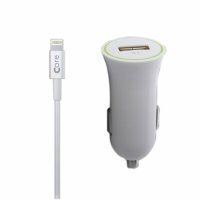 Looking for a quality in car I phone charger, this really is perfect for the job. You might have already noticed that the battery of your phone tends to die when you need it most, preventing you from using its most crucial features such as calling, satellite navigation or camera. Core Car Charger is a life-saver for those, who spend most of the time on the road, ensuring that the device you use most is always charged and ready to be used. This compact car charger pushes 1A of power to its single USB port, which can be used to maintain and replenish your phone's or tablet's battery level. The charger itself is very compact which makes it highly portable. Once inserted into the standard 12V car power socket, this charger will stay sturdy in place no matter wherever you go. It is a value, yet, functional accessory for both the frequent travelers or professionals who spend most of their time on the road. There is nothing better than getting some freebies! This Car Charging kit comes with a removable 1.2m Lightning to USB cable, which you can use to connect and charge your compatible Apple devices. This Car Charger features a universal USB-A charging port, allowing you to charge Lightning, Micro USB, USB-C and other devices with your existing charging cables. This may be your camera, MP3 player or any other device - this charger has got your back! This car charger offers a short circuit and overload protection whilst charging. This ensures the appropriate power output is used to charge your devices safely and efficiently, preventing it from overheating and catching fire.